To create a culture of excellent customer service you need everyone within your organization on board. With Service Essentials™ for Everyone, Moran’s fundamental solution, you’ll reenergize your entire staff with essential customer service skills. 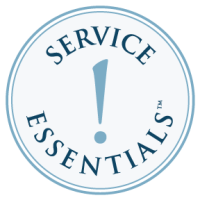 With Service Essentials™ for Everyone, Moran’s fundamental solution, you’ll reenergize your entire staff with essential customer service skills. Great service retains great customers. We estimate that 69% of lost customers don’t return because of bad service. Service Essentials™ for Everyone will give your employees the skills they need to not just satisfy customers, but to keep them returning to your business again and again. Service Essentials™ for Everyone is energizing. Interaction and real-world experiences are built into the learning process. We offer one-day or two-day training options. Training delivery may be divided up in a number of different formats to maximize the benefits for your organization. Case studies may be customized to demonstrate service issues directly related to your business. Individual assessment and action plans are included for improvement. Each participant receives an Essential Practices Card, a pocket-sized tool providing a summary of critical skills and can be kept handy in the workplace to reinforce desired behaviors. Participant Manual: The participant’s manual is a step-by-step guide for the learners. The manual includes exercises, reference material, self-tests, practice exercises, case studies, and action plans. Each participant of the training will need a participants manual to experience the learning process. Essential Practices Card: The Essential Practices Card is a pocket-sized tool designed to serve as a daily reminder of the customer service practices that reinforce the desired behaviors. Each participant’s manual includes one card for the learner’s reinforcement. Training Format: Six modules of training may be delivered in one or two days. Training delivery may be divided up in a number of different formats. Contact Moran Consulting, Inc. and we will be happy to give you some suggestions to maximize the benefits for your organization. This program can be trained by someone in your organization. 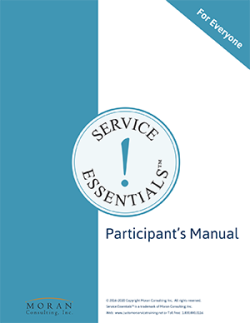 Participant Manual: The participant’s manual is a step-by-step guide for the learners. The manual includes exercises, reference material, self-tests, practice exercises, case studies, and action plans. Each participant of the training will need a participant’s manual to experience the learning process. Facilitator’s Script: A step-by-step script for the facilitator to deliver the six modules of training to the staff. The facilitator’s guide is simple to follow and covers every detail for the novice trainer. Facilitator’s Guide: A step-by-step guide for the facilitator to organize the logistics of the training. The guide includes a comprehensive training checklist, tips for facilitation, and the learning objectives for each module. PowerPoint Masters: All modules are supported by visuals. The training kit includes masters on a CD Rom for the facilitator to show during the training. A soft copy of the presentation (Created in Microsoft® PowerPoint®) is included in the kit as well. The program’s six fundamental modules, comprised of one- or two-hour training segments, give everyone in your organization the skills, attitude and awareness needed to please both internal and external customers. Get your staff on board with service. Attitude of excellent service Excellent service starts with the attitude of the individual service provider. This module helps learners see the connection between how they feel when receiving good and bad customer service and those feelings of the customers they serve. Hit the nail on the head in meeting your customers’ needs. Identifying customer needs Identifying customer needs is a skill that requires listening and probing. This module provides skill building in understanding how to identify customer needs. Energize your staff to perform award-winning service. Thoughtful body language and words Most communication with customers is through body language. This module provides practice in all areas of body language and words as they relate to service delivery. Every single interaction is an opportunity. Uncompromising service at every contact point Each contact point with a customer is an opportunity to delight or disappoint. This module guides learners through a comprehensive analysis of their role, and the service contact points for which they are responsible. Turn around unhappy customers and increase revenue. Resolving conflict Customers get angry and your staff needs the skills to handle them. This module provides learners with a simple process to professionally handle difficult situations without taking the customer’s anger personally. Let your customers grow your business for you. Exceeding customer expectations It is the little things that make a big difference. This module focuses on the opportunities to exceed expectations in such a way that customers speak highly of your business to others. In-House Trainings: Bring your employees together to interact, problem-solve and build great teams together. Webinars: Ideal if you have global and remote teams that make it challenging to have everyone together in one place at one time. Train the Trainer: Moran will help you identify and train your in-house talent who, in turn, will train your other team members. Do-It-Yourself: With our trainer kits your organization’s training team can learn to deliver our program to your entire team.